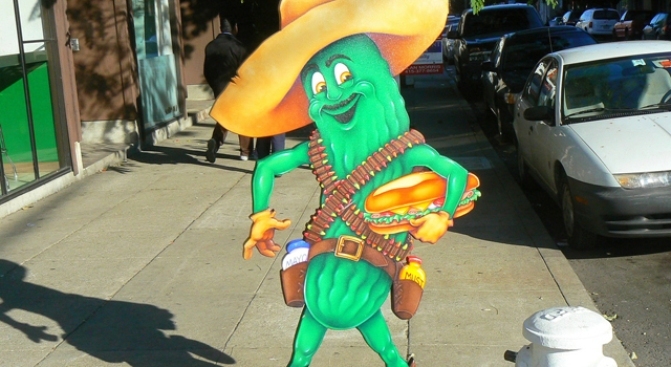 Mr. Pickle is back to standing on his street corner in the Mission. Our long national nightmare is finally over. After an epic 11-week hostage situation, Mr. Pickle has finally been returned to his home, unharmed. The mustache wearing, sandwich-holding mascot had been kidnapped from his perch on 20th and Treat streets in San Francisco's Mission District. But Monday night the long saga finally came to an end when the pickle robber called the owner of Mr. Pickle's Sandwich Shop and offered to return the beloved mascot, according to our friends at Mission Mission. The owner promised not to involve the fuzz if the robber returned the sandwich lover without incident. The mascot was returned anonymously Monday night, unharmed, with only a red bandanna to commemorate his capture. The robber was even nice enough to call to make sure the Pickle family was reunited. Mr. Pickle's owner said she would keep the bandanna on to remember the ordeal.